This is where the action happens, so to speak. All year round, the cobbled, pedestrian surface of Floriańska Street is the théâtre de l’action of the city, and the venae cavae to Kraków’s massive central square. It’s something of a modern stage for the unending drama of the city’s Old Town, where the players are tourists and locals alike, and the set pieces are the magnificent medieval façades of some of the most prestigious buildings in the city. The mix here is a curious one; on Floriańska the corporate symbols of McDonalds and Starbucks are overshadowed by the antique metal signage of some of Kraków’s oldest cafés – subterranean pre-war Kawiarni serving strong coffee and traditional, very ‘carby’, very Polish food. It’s a perfect place to just take some time and wallow in the atmosphere and energy of the city, or enjoy the countless bars and clubs that line the street. Florianska Street is named after one of Poland’s most venerated saints, St. Florian, and is part of the well-established, so called Royal Road, that runs from St. Florian’s church on Matejko Square, to the north of the old town, all the way to the foot of the Wawel Hill, on the Old City’s south side. 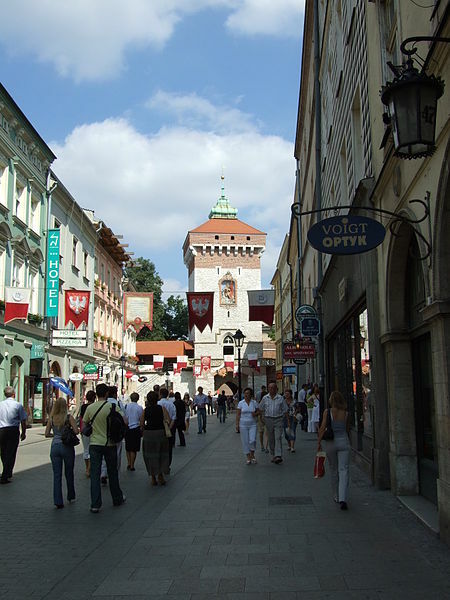 Commanding a substantial part of the route, that is supposed to incorporate all the architectural gems of medieval Kraków and was once the procession trail for kings, queens, princes and noblemen, Florianska is a still a bustling street, that’s riddled on both sides with interesting buildings. On its north, the imposing medieval defensive structure of St. Florian’s Gate, one of the Old City’s eight entrance ways, and still the most magnificently preserved example of middle age fortification in Eastern Europe, casts its long shadows onto Florianska. Underneath its archways, many of the city’s best buskers gather in the day, to make use of the acoustics of the tight-knit tunnel that passes into the Planty Park on the other side. The gate itself, also known as the Brama Floriańska dates from the 13th century, and is the only remaining original defensive tower in Krakow. Florianska is a great place to see how the old and the new interact in Kraków. In some of the neat and narrow gothic buildings, there are hostels or bars, and behind the elaborately decorated Renaissance façades, it’s possible to find a night club, or a sushi restaurant. In a way, it’s a microcosm of the city as a whole, where the post-communist manifestations of capitalism now thrive behind the attractive and anachronistic veneer of medievalism. Half way down Florianska’s first block on the east side, the House of Jan Matejko is a favourite of Polish local tourists, who come to the city to see the painter’s greatest works on display here. It’s the oldest biographical museum in the whole country, and contains a twofold exhibition, dealing with the art and the man himself. For the window-shopping tourist, there are plenty of interesting things to see from the street itself. The city’s oldest hotel, the Pod Różą, has a beautiful Renaissance style frontispiece and lays claim to some seriously VIP guests; from Russian tsars to the French realist writer, Honoré de Balzac. Further down, on the gothic front of house 17 and 18, a segment of the chain once used in the middle age to cut off access from Florianska Street at night, still dangles from the eaves.